I'm going to keep this brief, because I would like to make another post today, and don't want to overwhelm anybody! Chapter Four is all about introducing and inplementing Read to Self. One thing my librarian said she liked about my room was that she felt like my students got a lot of independent reading time. The sisters say, "When an independent reading component is added, test scores go up." I would like to think that my students get a lot of independent reading time, but I don't think it is any where close to what they need! I wish I could fit more independent reading time into our day! I do think the read and talk about the pictures works well for my students, ESPECIALLY when they are reading high-level nonfiction books; however, I do not give this option to my students for most picture books, because most of my students are beyond the reading level of most picture books. I do think reading and talking about the pictures would be very good for younger students. I also added a component to the "Ways to Read a Book". It is similar to retelling a previously read book. One thing my students and I practice is tracking our reader's voice and thoughts with sticky notes. As we read in our mini-lesson, and as the students read the GR books and LC book, we talk about recording our thoughts. The last ways I let my students read is by rereading their sticky notes. I LOVE this idea, because the students have such deep and interesting thoughts as they read, and their notes are a GREAT way to reread!! I can easily print the anchor charts for the students to put in their folders. I created this on PowerPoint and was inspired by Ladybug's Teacher Files. 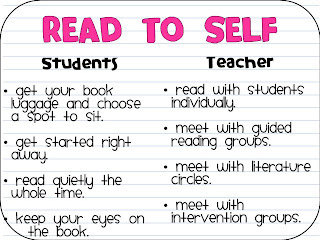 During the first week of introduction, I have my students model the correct/incorrect/correct way to Read to Self. We also talk about how to choose appropriate spaces in the room to read, and how it might not be the best idea to sit by someone we would be tempted to talk to. 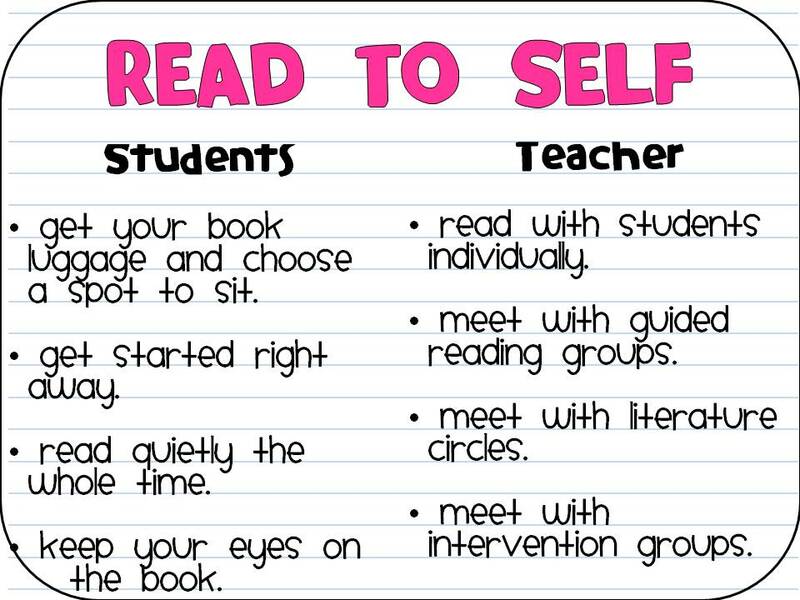 During the first two days, I place the students in places for reading, and after that allow the students to choose. BUT, if I see one student off task, we all gather back together. It is so important how The Sisters talk about building stamina. We start with 3 minutes, then gather and asses ourselves, then do three more minutes. We slowly build up our stamina each day. Our goal is 20-25 minutes of stamina, since that is how much time I am able to allocate to Guided Reading Groups/Literature Circles/Conferences. One of the best things I experiences last year was my student's assessing themselves, discussing what they did well, and discussing how they could improve. We had very open discussions about our stamina and behaviors, and my students were never scared to share how they could improve. I liked my students sharing, so that when we gathered again, we could ask students if they improved on the specific area in which they wanted to improve. "Paisley, I know you said you wanted to focus on tracking your reading so that you could reread your thoughts. How did you do on that today?" It really helped us keep each other accountable. I love reading everyone else's thoughts! Keep up the great work!